(AFP) - The United States and major South American nations recognised Venezuelan opposition leader Juan Guaido as interim leader Wednesday while the EU called for free elections to restore democracy, leaving President Nicolas Maduro increasingly isolated. Cuba, however, sprang to the defence of its socialist ally, expressing "solidarity" with Maduro while Mexico extended lukewarm support to him. 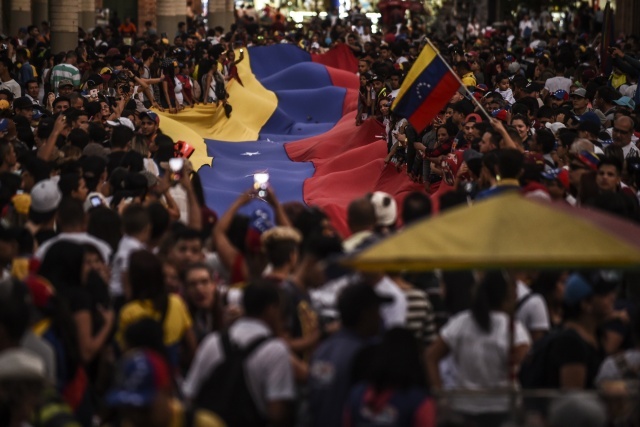 The US said it stood ready to use "all options" if Maduro tries to quash the opposition, in what was an implied threat of military force. And the US State Department said "former president Maduro" did not have the authority to sever relations. Tweeting from the Swiss ski resort of Davos, where he and other leaders were attending the World Economic Forum, Brazilian President Jair Bolsonaro said: "Brazil recognises Mr. Juan Guaido as Venezuela's interim president." Colombian President Ivan Duque, another US ally also at Davos, told reporters his country was behind Guaido and will "accompany this process of transition to democracy so that the Venezuelan people free themselves of their dictatorship". The European Union did not join the countries lining up behind Guaido but called for "free and credible elections". "The EU strongly calls for the start of an immediate political process leading to free and credible elections, in conformity with the constitutional order," the bloc's diplomatic chief Federica Mogherini said in a statement. The bloc and its member states "remain ready to support the restoration of democracy and rule of law in Venezuela through a credible peaceful political process in line with the Venezuelan constitution", she added. And EU Council President Donald Tusk tweeted that "I hope that all of Europe will unite in support of democratic forces in Venezuela". He added: "Unlike Maduro, the parliamentary assembly, including Juan Guaido have a democratic mandate from Venezuelan citizens."